We suffered through 16 miles in 9 degree temps. It wasn’t as bad as I thought it would be, either. The funny thing is that the distance didn’t scare us, just the cold. So either we are becoming stronger runners or wimpier Alaskans. We ran along the Coastal Trail, and in open areas the wet air drafting over the inlet was brutal. My face was so cold by the time I finished that I couldn’t talk. I do need to get a face mask. I had a neck gator, which I pulled up over my mouth, but it became damp and then froze, whick only caused my face to become colder. So sorry, no pics. I couldn’t stop running, for fear of becoming chilled. When you are out running in skinny tights and a thin windbreaker and expecting your body energy to keep you warm, there is a thin margin for error. But we did run negative splits and finished strong and within my MP goal (I was trying for a much slower pace but I wanted to get it over before my face permanently froze into a runner’s gasp). 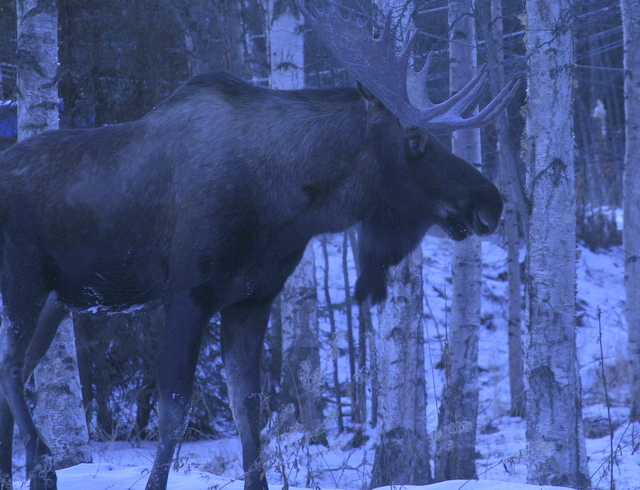 Today, we were blessed with a visit from another moose, a big male with a huge rack, which I found sleeping in the yard when I went out to get the mail. 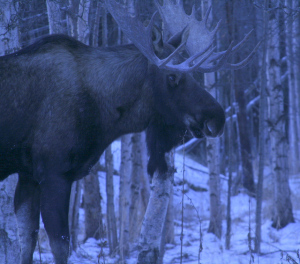 Without further ado, meet my new favorite moose. Don’t you love the blues? This is how the light looks each afternoon. It’s like nothing else. 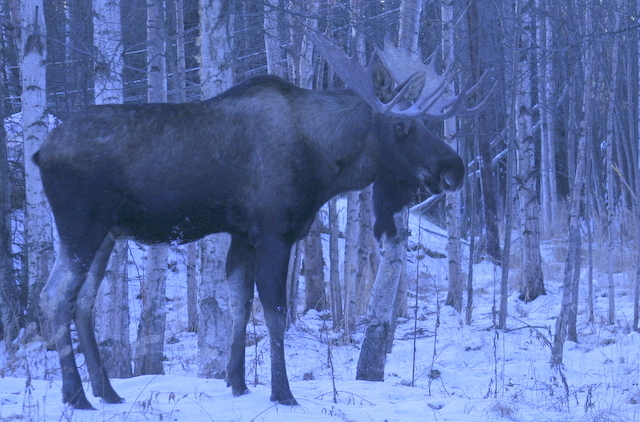 And one pic with the flash, which highlights the moose but fades out the beautiful blues. Those blues are unreal! How close do you get to the moose? Do you know when you see the same one again? I know! Aren't the blues lovely? 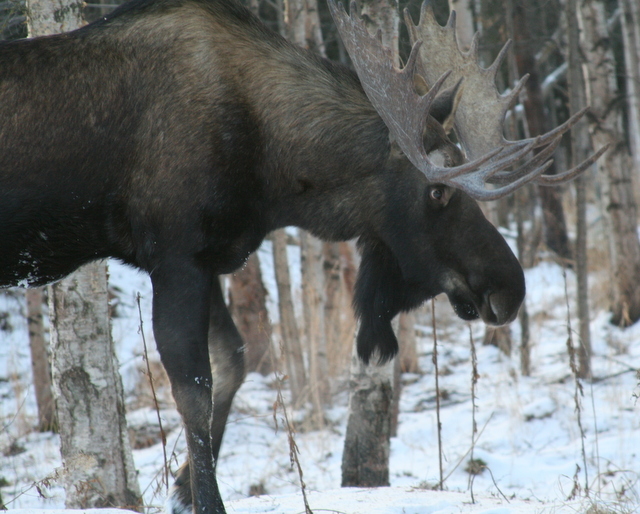 I was a bit too close for comfort to this moose but it seemed pretty laidback. I have no idea how to tell them apart except that some have racks, some don't, some are big, some are small. That's the extent of my knowledge, hee, hee. Pretty moose. Maybe you need to give each of them name tags to tell them apart. The blues we see here at the end of the day are a little yellower than your lavender, but pretty all the same.